Why Join WVSF and ASI? The American Sheep Industry Association, along with the West Virginia Shepherds Federation, has worked diligently and successfully to lobby on behalf of all sheep and goat producers. The WVSF sponsors the WV Wool Pools, shearing schools and sheep and goat management workshops, and maintains a website and an e-mail list for members. As producers, we have benefited immensely from the work of the WVSF and ASI. Please join and assist the West Virginia Shepherds Federation and the American Sheep Industry Association in continuing the good work for all of us! 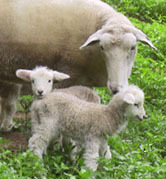 The West Virginia Shepherds Federation has created an e-mail list as a forum for discussing sheep and goat concerns in WV. This group is open to anyone interested in sheep and goats in West Virginia. WVSF Café Press Store where you can purchase t-shirts, hats, mugs, and tote bags with the WVSF logo.